1. (BASKERVILLE). 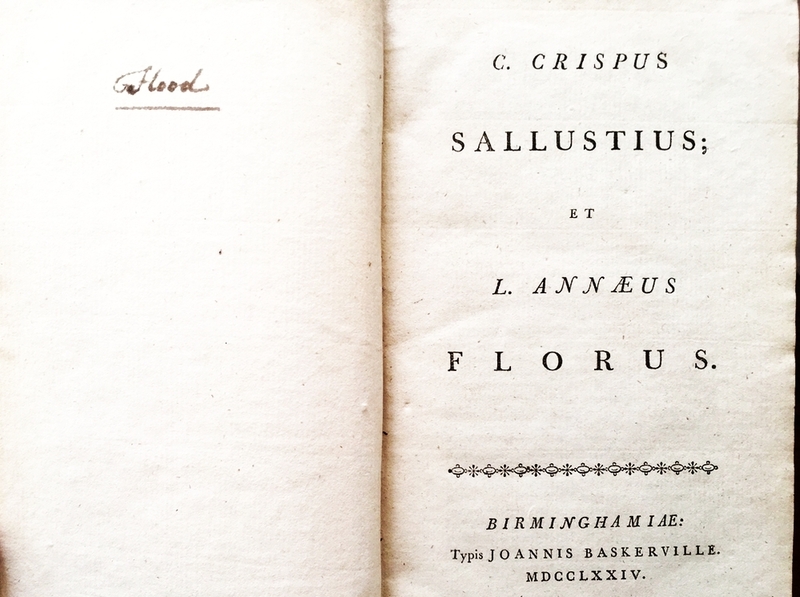 SALLUSTIUS CRISPUS, Gaius, & Lucius ANNAEUS FLORUS Bellum Catilinarium/ Bellum Jugurthinum/ Epitome rerum Romanarum. Birmingham, John Baskerville, 1774. 17 x 11 cm. Contemporary speckled calf, spine gilt in six compartments, five decorated with crossed arrows, one with a black leather title label. (4), 276 p. A little wear at the spine edges and corners. 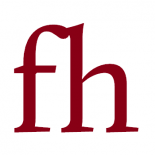 Name of a former owner (‘Flood’) opposite the title page. * Very serene and attractive book, one of the last printed by John Baskerville, in an attractive binding. Several page numbers are in error, 265 instead of 264 and 275 instead of 274 (the last numbered page) and the complete signature O is misnumbered 117-128 instead of 157-168 – Gaskell 55, the first variant (a)! 2. (INCUNABLE). AQUINAS, THOMAS Opuscula. Venice, Hermann Liechtenstein, 1490, September 7. 25 x 18 x 8 cm. Contemporary pig leather binding with rich blindstamping over beveled wooden covers, bound strongly on three double cords. 436 leaves. Gothic type. Some wear and wormholes. Some underlining, a few tiny marginal notes, well readable. * Collection of 72 pamphlets and short essays, edited by Aquinas’ biographer Antonio Pizamano (or Pizzamano, 1462-1512), a friend of Domenico Grimani and later bishop of Feltre. Attractive typography. Many detailed and lovingly drawn red lombards, partly with playful appendages. 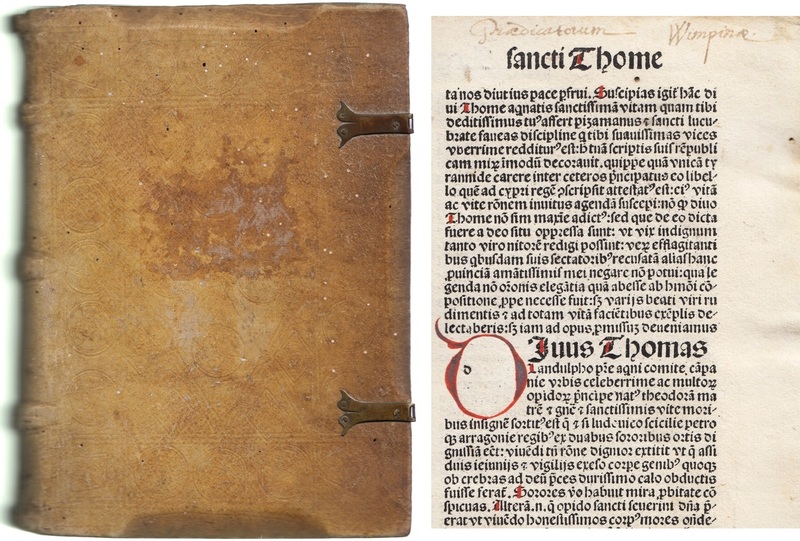 According to an inscription in red ink (dating from the early 16th century) this book was owned by the Dominican monastery of Wimpfen (‘Wympina’) in Baden-Württemberg, especially for the use of ‘Michaeli Vhe’, one of the most important monks of the monastery: Michael Vehe (1485-1539), an apologetic theologian, also the editor of the first Catholic hymn book with music. Wimpfen was Vehe’s main residence in 1500-1506 and 1513-1515. Also with a 19th-century rubber stamp of the Grossherzoglich Hessische Hofbibliothek (Darmstadt). Inserted is a 1929 invoice of a Darmstadt antiquarian bookshop, with the name of typographer C.H. Kleukens (1880-1954), at that time professor at the Arts and Crafts School in Mainz. Goff T 258. In all, a clean and impressive incunable with a fine provenance. 3. 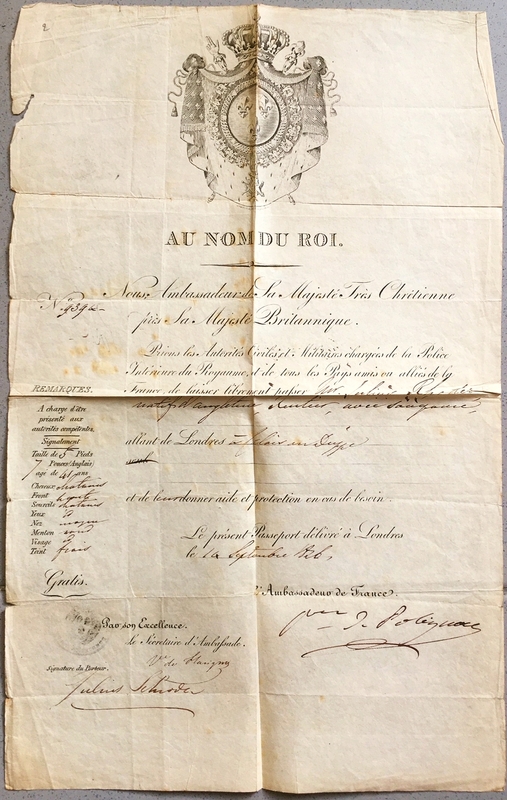 (POLIGNAC, Jules de) Passport for Valérie Gromez, signed by Prince Jules de Polignac as Ambassador of France in Britain. Twice folded passport of wove paper, 420 x 240 mm. Engraved with the arms of King Charles X of France, signed J. Warwick Sc., Strand, London, for ‘Mme Valérie Gromez, native de Paris (Mentière), allant de Londres à Calais au Boulogne’, described as 20 years old. Delivered in London on June 29, 1826 and signed by the Prince of Polignac and his secretary Maurice de Flatigny, and by Valérie Gromez. With 9 stamps in red and black and 9 signed declarations (recto and verso) of various officials obtained during the journey. Some creasing and damage, but in good condition. * Prince Jules de Polignac (1780-1847) was an important French politician, premier from 1829-1830 and instrumental in the fall of his King Charles X. From 1823-1829 Polignac was Ambassador in Britain, and as such he signed many passports (in fact, it was through the signing of her passport that he met his second wife, Charlotte Parkyns). A Valérie Gromez was mentioned together with Claude Dorsent as a milliner and dressmaker in the firm of Mesdames Drysdale, Valérie Gromez and Company in Old Cavendish Street, London. Maurice de Flavigny (1799-1873) was Polignac’s personal secretary and later a politican on the Liberal Catholic side. 4. 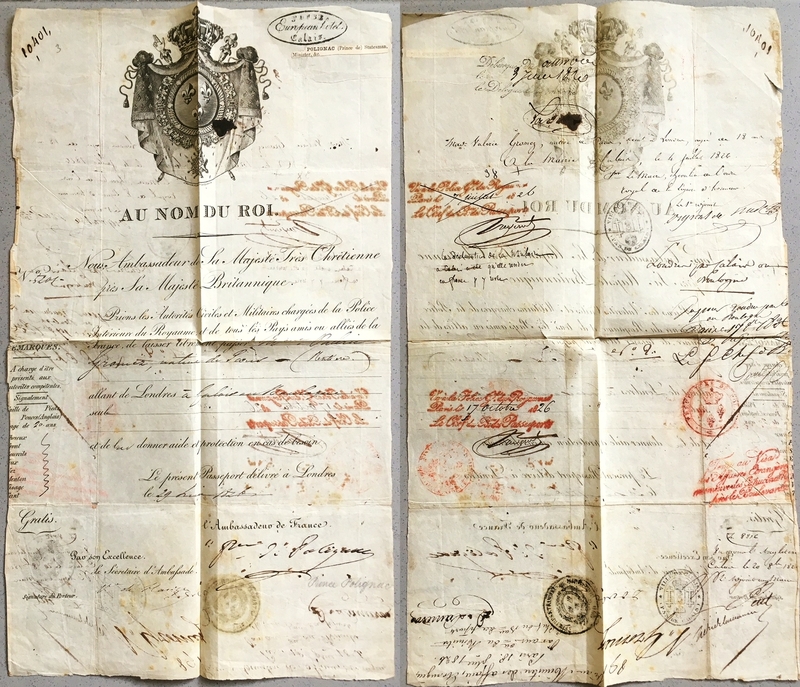 (POLIGNAC, Jules de) Passport for Julius Schröder, signed by Prince Jules de Polignac as Ambassador of France in Britain. Passport of wove paper, 435 x 277 mm. Engraved with the arms of King Charles X of France, signed J. Warwick Sc., Strand, London, for ‘Mr. Julius Schröder, natif d’Angleterre, Rentier, avec (unreadable), allant de Londres à Calais au Dieppe’, described as 41 years old, having a fresh complexion, chestnut-colored hair and a round chin. Delivered in London on September 16, 1826 and signed by the Prince of Polignac and his secretary Maurice de Flavigny, and by Julius Schröder. With a stamp of the embassy. Some creasing and small folds, but in very good condition. * A Julius Ludolphus Schröder, son of Herman Schröder, was a sugar refiner in London 1819. He was still alive in 1837. 5. (THORBECKE, Johan Rudolph). 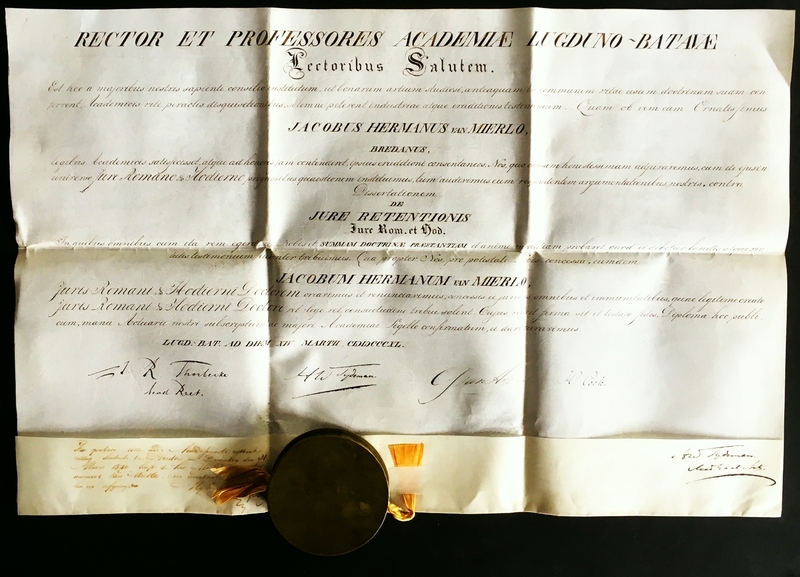 PhD on vellum, dated March 14, 1840, of Jacobus Hermanus van Mierlo (1816-1905), signed by Johan Rudolph Thorbecke, Van Mierlo and university officials. Vellum with attached (broken) wax seal in copper box. Oblong 32 x 50 cm. Recto only. Written in ink on fine white vellum. Folded.